FOCUS team is helping community in GLOF at Badswat, Ishokman, Pakistan. 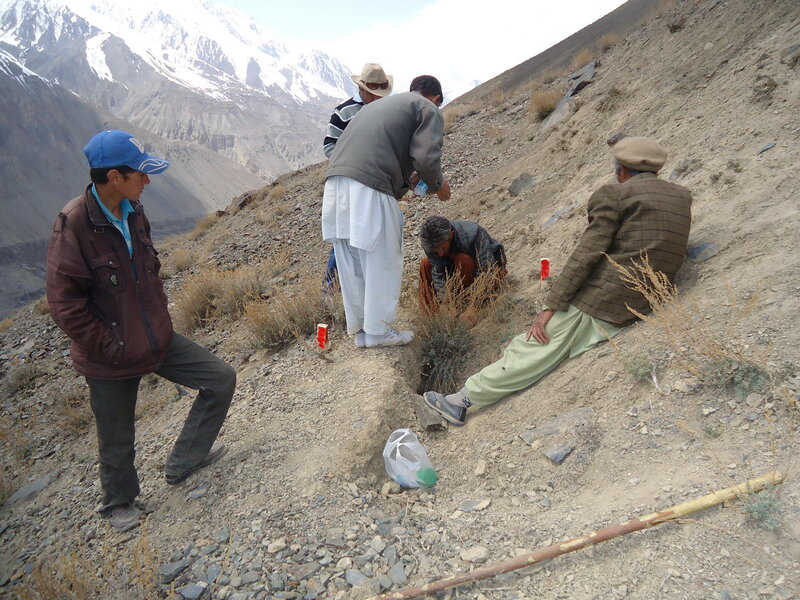 Hazard and Vulnerablity Assesment- 2011- Geologist busy in Map Verification- Ghizer, Pakistan. 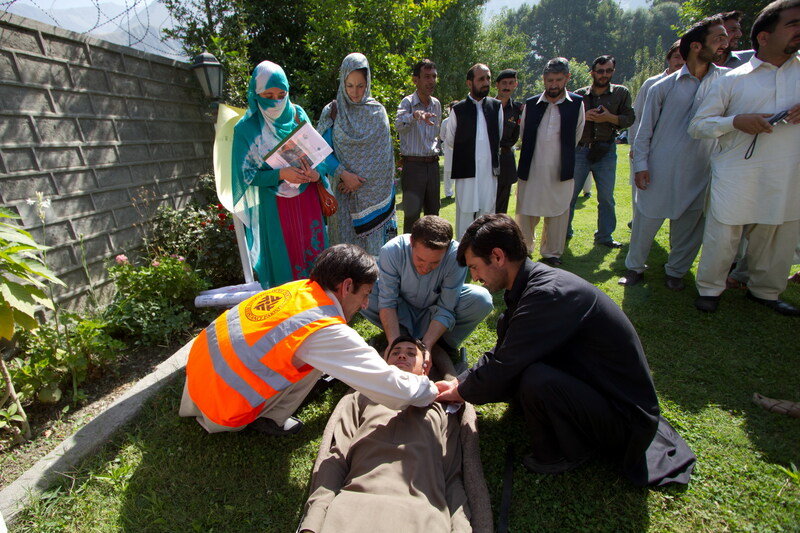 Participants who received training on Disaster Risk Reduction are demonstrating emergency rescue activity at Experience Sharing Workshop, Chitral, Khyber-Pakhtunkhwa, Pakistan. AKDN's activities in this area are coordinated by two programmes which form part of the Aga Khan Agency for Habitat (AKAH). The Aga Khan Planning and Building Services works to address built environment issues in marginalised regions of the country while Focus Humanitarian Assistance (FOCUS) Pakistan conducts research and design solutions to reduce the impact of natural hazards on vulnerable communities. These activities include the training of Emergency Management teams, which aim to build resilience against disaster events while building the capacity of community members in Disaster Risk Reduction (DRR) and Community-Based Disaster Risk Management (CBDRM). The project also conducts hazard and risk assessments and works to improve risk anticipation through the establishment of an Early Warning System (EWS). AKAH has trained tens of thousands of volunteers for disaster response and management across Central and South Asia, and many more in the other countries in which it works. For its work in Pakistan, it is the recipient of the Sitara-i-Eisaar award, which was conferred by the government of Pakistan in recognition of its humanitarian assistance during the 2005 Kashmir Earthquake. 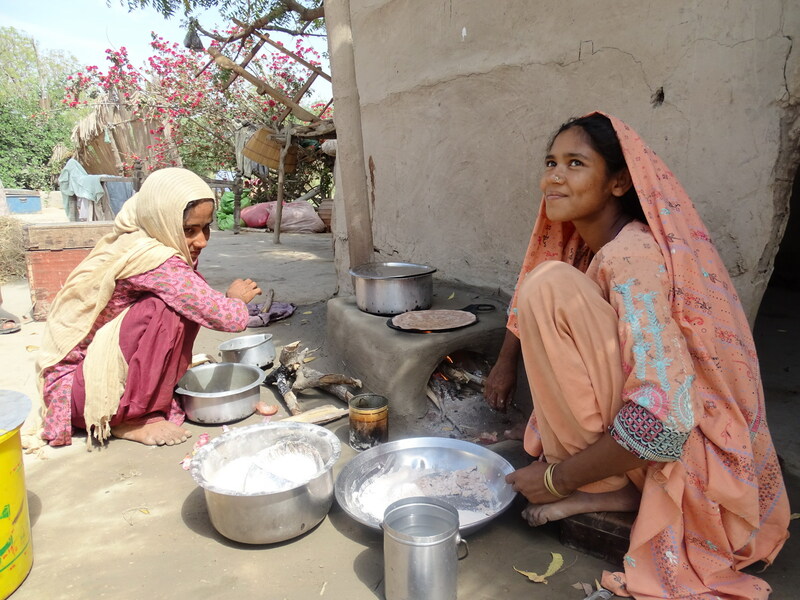 Smoke-free stoves cook, heat water and warm homes in Northern Pakistan. 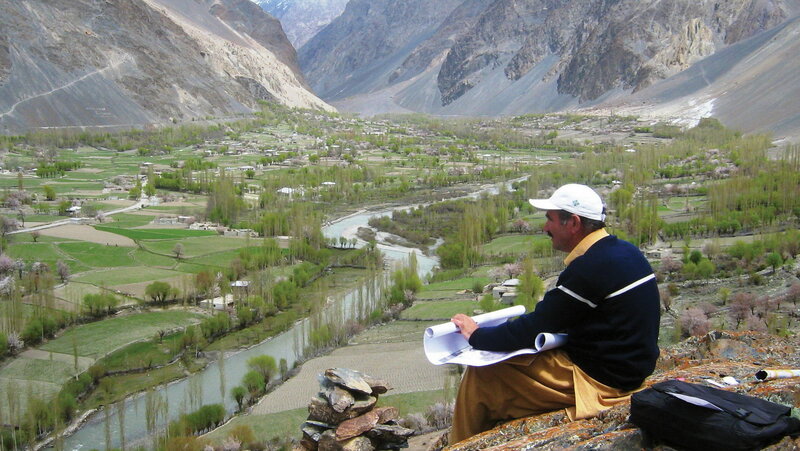 The Aga Khan Planning and Building Service, Pakistan (AKPBS,P) works in programme areas such as safe water supply systems; village sanitation facilities; thermal and energy efficiency; renewable energy; vocational training in construction skills; retrofitting & safe construction of low-cost housing; village planning; and disaster risk reduction. This is supplemented by the provision of material and technical assistance, and construction management services for rural and urban areas. AKPBS has developed a number of flagship programmes; the Water and Sanitation Extension Programme (WASEP); the Building and Construction Improvement Programme (BACIP); and the Habitat Risk Management Programme (HRMP). WASEP was initiated in 1997 with an aim to provide integrated water supply infrastructure services and to help prevent water-related diseases through improved hygiene and sanitation practices for local communities in the high mountain regions of Gilgit-Baltistan and Chitral, as well as the coastal lying areas of Sind. Approximately 80 to 85 percent of the population in these areas do not have access to potable water and 60 percent of the population collects water from open channels, often requiring a walk of up to three kilometers several times a day. Women and children are responsible for collecting water for domestic needs, which can be time- and energy-intensive, drawing children away from studies and women from their household chores and other income-generating activities. In 2003, WASEP was identified as a best practice by the WHO; subsequently in 2005, WASEP was named the winner of the prestigious Alcan Prize for Sustainability by the Prince of Wales International Business Leaders Forum; awarded the Dubai International Award for Best Practices in 2009 for the transfer of community based water and sanitation technologies along with health and hygiene education; and awarded the National Energy Globe Award in 2010 for efficient water supply and eco-sanitation. AKPBS,P’s Building and Construction Improvement Programme (BACIP) was set up in 1997 as a sustainable model for reducing the pace of deforestation and CO2 emissions in Gilgit-Baltistan and Chitral; reducing the incidence of diseases caused by indoor air pollution and improving the living conditions of target communities by reducing their economic burden through the development and supply of energy efficient and home improvement products and technologies. As a direct consequence, BACIP also aimed to improve the health, and quality of life of these communities. BACIP has developed and tested over 60 products and technologies to improve living conditions and indoor environment in rural and urban areas. BACIP’s life cycle approach to household energy efficiency, market development and entrepreneurship have been recognised by local communities, public sector organisations, donors and international agencies alike, for having a visible impact on the lives of the community in terms of economic benefits, social improvement, and environmental conservation. Over 70 different interventions have been developed. For its programmatic approach and application in contributing to improved socio-economic and environmental condition of local population in Gilgit-Baltistan and Chitral, AKPBS,P has received numerous accolades for BACIP, including the UN-HABITAT World Habitat Award in 2006; Energy Globe Award in 2008; PCIA Global Leadership Award; and the prestigious Ashden Award in 2011 for avoiding deforestation. BACIP has also been recognised by the United Nations Development Programme as a Best Practice. In order to specifically address the issues related to habitat risk, the organisation initiated a comprehensive Habitat Risk Management Programme through a wide range consultation with stakeholders from all levels, particularly with communities at risk, with the ultimate goal of promoting sustainable communities through enhanced resilience and coping capacity in dealing with natural hazards. HRMP was initiated to create public awareness and develop affordable technologies to construct safe and disaster-resistant buildings (houses, schools and hospitals) for rural and urban areas. AKPBS,P also contributes to relief and early recovery efforts following natural disasters. Relief efforts include the provision of temporary shelters, water supply and sanitation facilities, and skills development for affected communities and villages. A comprehensive reconstruction programme encompassing permanent seismic resistant housing, environmental health, community capacity building, and livelihood opportunities is underway in Gilgit-Baltistan and Chitral to assist flood and earthquake affected populations. AKDN's integrated response to the devastating floods that hit Pakistan in 2010 extends across a continuum of services from emergency relief to long-term recovery. Climate change is considered to be one of the most significant development challenges of recent times. In addition to institutionalising climate change, increasing community resilience and disaster preparedness, FOCUS Pakistan is working on Climate Change Adaptation related projects, in partnership with government agencies, donor agencies and academic institutions. Community Education and Awareness: The communities at high risk of climate induced hazards are provided training, education and awareness on responding to the climate extremes as well as taking adaptive measures. This includes educating communities on flood management, torrential rains, snow avalanches, Glacial Lake Outburst Floods (GLOFs), heat waves and other associated hazards. FOCUS implements hazard management related projects on snow avalanche readiness, flash flood / flood management, heat wave management and disaster preparedness. 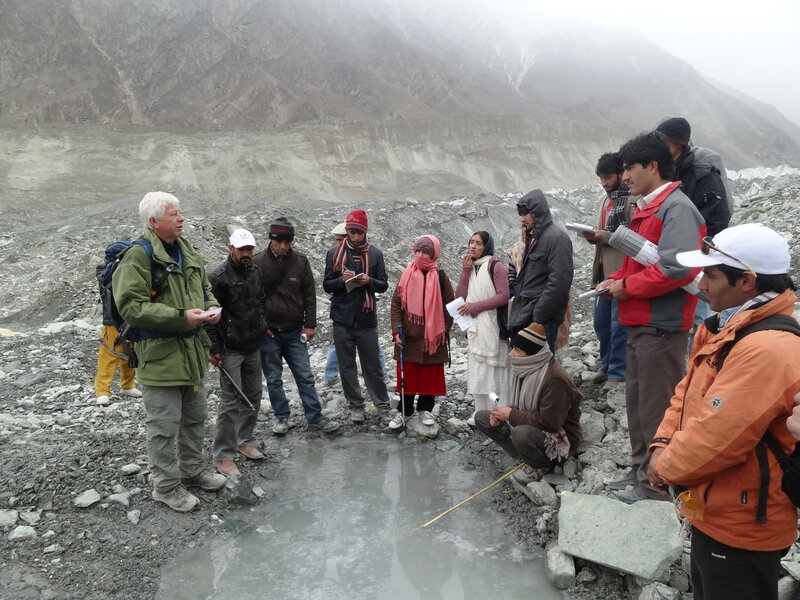 Rapid Assessments and Remote Hazards Mapping: FOCUS Pakistan conducts regular assessments of glaciers, landslides, remote and glacial lakes to anticipate the risk of GLOFs and other climate induced hazards. These assessments are conducted with local communities to ensure a community based monitoring system. FOCUS Pakistan is currently monitoring 25 glaciers and 20 lakes in Gilgit Baltistan and Chitral (GBC) in addition to potential landslide sites. Hazard Assessments, Mapping and Risk Mitigation: Hazard specific assessments and maps are created for floods, flash floods and snow avalanches. This also includes the remote sensing and modelling of glacier breaks, flood monitoring and triggering of snow avalanches. In addition, the construction of flood protection walls and flood evacuation routes are implemented. Advocacy, Research and Studies: In order to better understand and integrate climate change induced hazards into its disaster risk management strategy, FOCUS Pakistan conducts social and scientific research on the impacts of climate change on vulnerable communities, and arranges seminars and conferences in collaboration with academic institutions and donors. To date, two research studies on the Impact study of Climate Change in Gilgit and Chitral, 2010 and an Impact study of Climate Change in GBC, 2015 have been conducted. In addition, four seminars have been arranged on the impact of climate change on mountain and coastal areas. Effective Natural Resource Management for Risk Reduction: As part of the Climate Change Project, locals at the village level are also oriented with improved natural resource management. This includes, effective water management, rotational grazing, and the promotion of plantation. Installation of monitoring station at Dalkoi lanslide - Yasin, Pakistan. Other initiatives through which FOCUS Pakistan is making strides in climate change adaptation include road safety and plantation and irrigation assessment. FOCUS strives to create disaster resilience through structural and non-structural mitigation measures. Non-structural mitigation projects include specialised plantations for soil stabilisation, early warning and monitoring of landslides and the removal of boulders through controlled blasting. Structural mitigation projects include the construction of protective walls, gabion walls and check dams to prevent land erosion and flood control. FOCUS works closely with Aga Khan Planning and Building Services, Pakistan and the Aga Khan Rural Support Programme with the implementation of its structural mitigation projects. Since 2005, FOCUS Pakistan has completed 22 structural mitigation projects, which include protective walls that are designed to shield against a variety of potentially hazardous and naturally aggressive events such as flooding and debris flows in disaster prone areas across Northern Pakistan. Pakistan is working on a comprehensive road safety programme, which involves the mapping of hazardous spots along the roadside, placement of precautionary safety boards with hazard signs, and the training of drivers on road safety and first aid. Additionally, to ensure effective responses to road accidents, FOCUS trains policemen and women in basic first aid and casualty handling. FOCUS Pakistan works closely with the Pakistan Meteorological Department, Royal Norwegian Embassy, Government of Canada’s Department of Foreign Affairs, Trade and Development, International Centre for Integrated Mountain Development and AKDN agencies to implement climate adaptation programmes.